Thomas More Square is a ‘business village’ on the edge of the City of London, adjacent to St Katherine Docks and the Tower of London beyond. Works undertaken in 2015 were the first major redevelopment of the site since its construction in 1990. In addition to upgrades to the 6 major buildings, the public realm in between was also subject to re-design by landscape architects BDP. 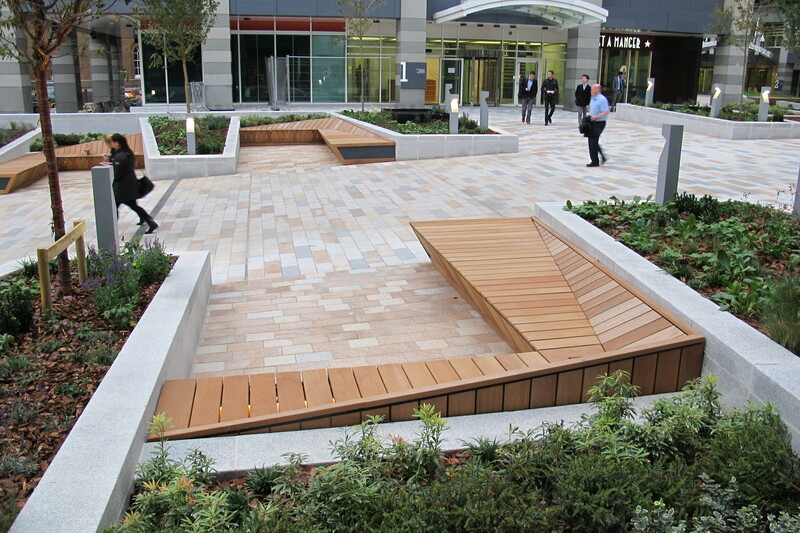 The previously uninspiring space of hardstanding, small grassed areas and isolated trees has been transformed into a high quality area with new paving, built-in planters and significant new seating provision to allow office workers and visitors to enjoy the outdoor environment. BDP approached Furnitubes with a concept seating design characterised by a complex arrangement of intersecting angled planes to fit into dedicated alcoves in the raised planters. From this concept the skilled Furnitubes designers were able to develop the complex geometry by 3d modelling each of the 6 unique seating structures, and a complementary large scale wall-top platform. Seating was used in mirrored pairs either side of the main walkway and included flat benches, and seats with single plane and compound angle backrests, all custom-designed and made to fit the challenging levels of the site. The seating was designed on the principle of timber panels fitting over an internal steel frame, with hidden fixings used throughout. 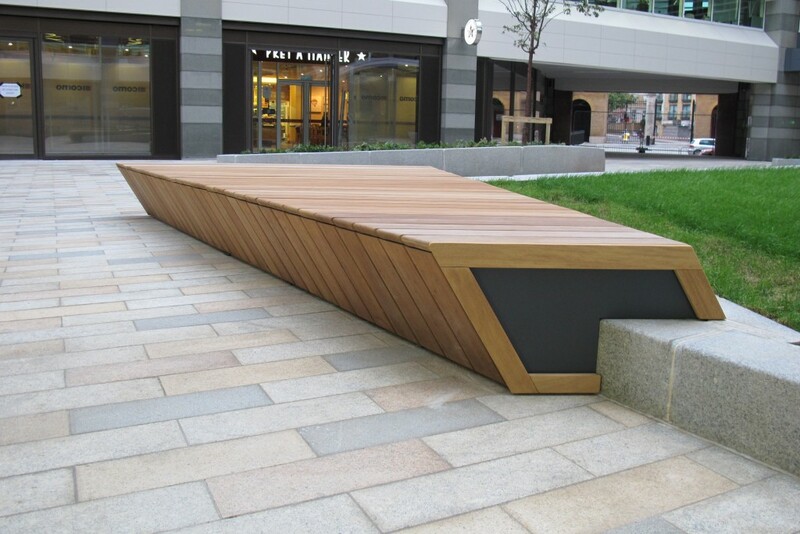 In the opinion of all parties involved in the project, the seating looks stunning and truly enhances the quality of the external spaces of Thomas More Square.